One of the hassles of travel for me is toting around an entire file folder of flight, hotel and rental car confirmations. Why do the confirmations have to be 5 pages long? Even if I print only the first page, on a 3-4 week assignment that frequently entails 30-40 pages of confirmations. Enter the niftiest app I use. It’s called TripIt and I’ve fallen in love with it. Here’s what it does and how it works. 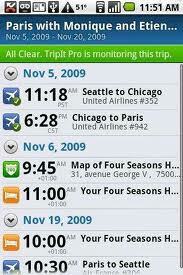 TripIt creates a complete itinerary of your trip and makes it available on your smart phone, laptop and desktop. I do mean complete, from flight info to hotels, rental cars, events, whatever. It automatically syncs across all platforms as soon as I make a change on any device and stores the information in the Cloud for instant retrieval. Once you register, all you need to do is forward your confirmation emails to TripIt and it automagically adds them to your itinerary. You can configure the app to automatically detect reservation emails to your inbox and they will auto-magically appear in your itinerary. That’s it. No subject heading to add, not even one word of explanation. It detects from your email address that the confirmation is for your itinerary. TripIt includes your departure gate, synced to your mobile device as soon as the airline releases it. It also advises of delays and alternate routings. The itinerary includes your confirmation number, reservation number, addresses of hotels. Amazingly, TripIt simultaneously downloads a Google map of the area, with a pin showing the location of your hotel or car rental agency! Plus, it adds a constantly updated weather report for each stop in your itinerary. I love TripIt and shudder to think of doing without it. No more carrying around reams of paper. Everything in one place, available in a tap and swipe. You can have multiple trips going at once. TripIt even keeps track of every one of your airline miles accounts. Okay now, I saved the best for last. The cost of this app is a big, fat 0. Zilch, nadda, zip. I will say that I upgraded to their premium version called TripIt Pro that goes for $49 a year and includes lots of power features. 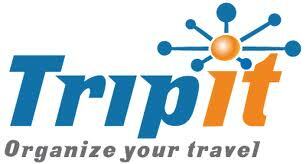 Go to TripIt.com for more info and an entertaining video.